Watch Your Step! Saigon’s Amazing Concrete Tiles. A short story about Vietnamese encaustic cement tiles from a Spanish point of view. Expressions like, "walk with your head held high" or "look forward" don’t always work, at least if you are in Saigon - to look to the floor can sometimes reveal hidden gems. Coming from Andalusia, Spain, I was used to seeing cement tiles around me my entire life, as the Muslims occupied the region for more than seven centuries. But it was really surprising to find in HCMC, in a remote rural public school, the same kind of tiles. After noticing the first one, I saw these tiles in other schools and hospitals. Finally, I discovered the amazing floor of the Central Post Office and, due to the similarities, I decided to investigate where they come from and was surprised to learn that much of them are made in Vietnam. It seems that the origin of cement tiles dates back to the time of the ancient Assyrians, who extended this technique for decorating homes throughout Arabic countries and to the East. They manufactured the tiles to better facilitate the typical behavior of taking one’s shoes off before entering a home. In Europe, the cement tile was introduced in the 7th century by Muslims who had learned the technique from the Persians. Due to its huge success, many other countries begin to introduce this element in their buildings, and France was one of these – by the 19th century, cement tiles were being manufactured in the French city of Viviers. By this time, tiles were popular not only in Europe but also in the United States. Vietnam, as a French colony, inherited the technique in the 20th century. The French brought all the necessary machinery to teach Vietnamese workers how to manufacture the product. Vietnamese, known worldwide for their handmade art, became masters of this legacy. In its early colonial development, many buildings in Vietnam were introduced to the tile as an architectural element. 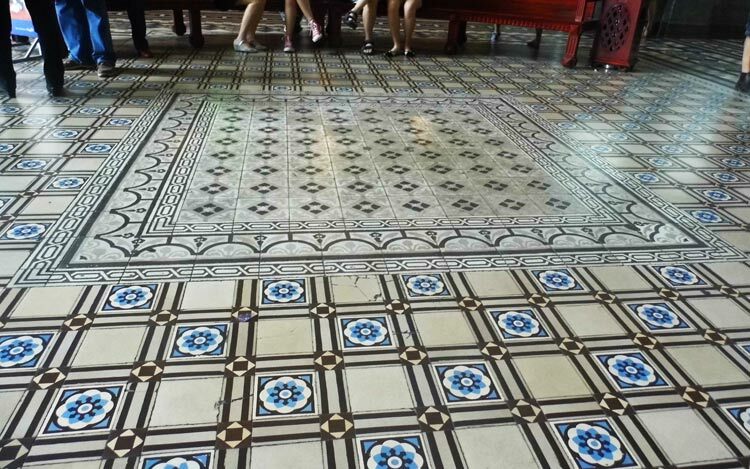 We have many examples in Saigon, such as the amazing floor of the Central Post Office or the Notre Dame Basilica, where the original tiles were brought in from France but were damaged during the American War and have since been replaced by Vietnamese ones. Due to the simple machinery required to manufacture tiles, many family businesses began to produce them and its original architectural use was extended, right after the country’s independence, to many other buildings around the city including public schools, hospitals and even private modest houses. Tiles had gone from classical ornamentation to utilitarian. An amazing sample of the old tiles can be found in the old opium manufacturing area on Hai Ba Trung, where trendy restaurant, The Refinery, conserves the old tiles beside new ones, creating a wonderful contrast. These tile floors are beautiful, full of colors and shapes, very clean and soft. And some national companies have been looking to revive their glory days, transforming and adding to their original flair, allowing them to take the position they deserve. The time of Vietnamese tile is back; we have companies exporting them all around the world.